we are happy to announce the initial release of a useful new tool called xmlmirror. as the name more or less spells out, xmlmirror is an XML webeditor with schema validation, based on webforms and implemented with codemirror. 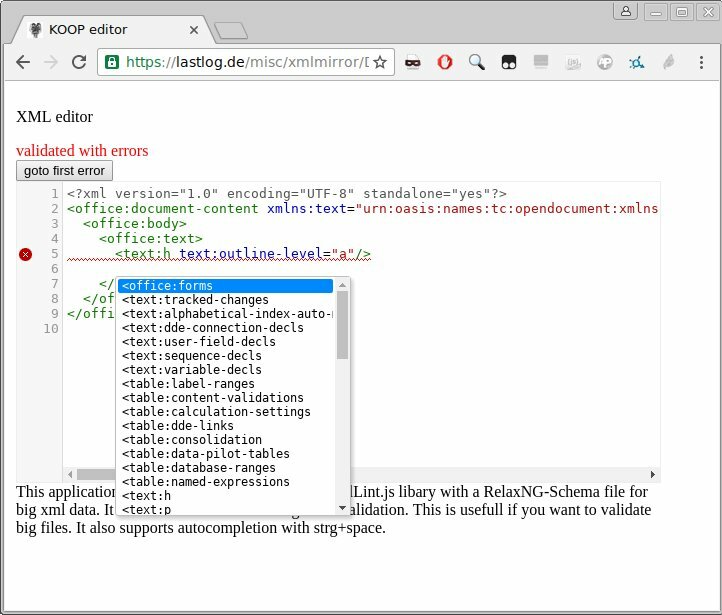 xmlmirror further uses a library called Fast-XML-Lint which uses libxml2 for schema verification and which is compiled with emscripten. or in layman’s terms: a web application that really helps you to create complex XML documents from scratch, as well as fix existing documents that are broken. nix-shell -p python35Packages.selenium firefox-bin --command "python3 selenium_test.py"
hint: it was no joy to use this tooling due to a lack of documentation and examples. and this is the exact order of libxml2 function calls xmllint issues to parse test_fail1.html! note: this helped us a lot and made it possible to discover the secret xmlLineNumbersDefault function! since nix runs on all linuxes, mac os x and other unix-like platforms, you can now enojoy full toolchain automation and deployment when doing emscripten. see Makefile.emEnv and Makefile.nativeEnv respectivly. alias c="while true; do inotifywait * -e modify --quiet > /dev/null; clear; make closure| head -n 30; done"
echo "welcome to the emEnvironment"
PS1="emEnv: \$? \w \[$(tput sgr0)\]"
you will notice that emEnv is a stdenv.mkDerivation and it uses shellHook and buildInputs. note: the default.nix does contain libz, json-c, xml-js packaging and since this is now in nixpkgs it is kind of obsolete now. we (paul/joachim) want to thank Jos van den Oever (prolific open source contributor and co-chair of the OASIS ODF TC on behalf of the Dutch government) for inspiring the creation of this tool. ODF is a prominent example of a real-world standard that leverages the relax ng standard, and we expect xmlmirror to be very useful in the creation of more ODF autotests. Jos has also graciously offered to provide an initial host repository for xmlmirror. schema parsing in codemirror can now easily be extended with all relax ng schemas! we also want to thank nlnet foundation for their financial contribution from the ODF fund which enabled us to complete this interesting project. thanks as well to Michiel Leenaars (not only from nlnet but also one of the people behind the ODF plugfests) for his interest in the project. now we have a real powerful xmleditor, made huge progress with the emscripten toolchain on nixos and have created a pretty useful development workflow. if you have questions/comments, see nixcloud.io for contact details.